Give the Gift of Relaxation at the Best Day Spa in Tanglewood, HOUSTON, TX. Give the unforgettable, luxury-inspired gift of sheer pamper with a gift card. Whether you’re looking for corporate gifts, holiday gifts or simply a way to brighten someone’s day, our spa gift certificates offer that special someone pure indulgence with a full day of spa treatments. Guests can come and escape by enjoy everything from invigorating massages to skin tightening, nail services and facials in a soothing environment. Available as E- Gift Cards as well, Serente Spa Gift Certificates give your friends, family and business associates a day of tranquility in the best hands possible. Expert licensed therapists, warm hospitality and a beautiful environment with luxuries charm make each experience truly exceptional. 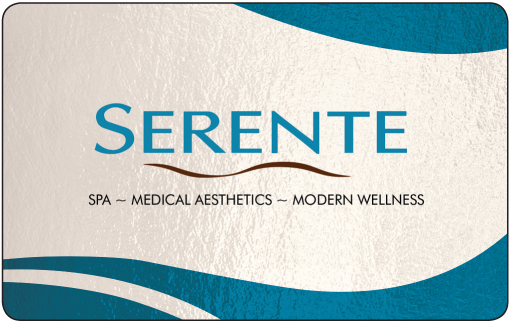 Purchase a Serente Spa gift card for any amount, package, or service. When you need holiday gifts, corporate gifts or more, our Serente Spa gift cards are the perfect option and they’re available in any denomination. You have the choice of a physical card with packaging mailed to either you or the recipient, or E-Gift cards, which can be printed from your computer instantly. You may also purchase your Serente Spa Gift Certificates at our day spa or by calling 713.621.7722. Click here to see a detailed list of our Treatments designed especially for your loved one. We strive to give our clients an extraordinary experience while visiting our spa. You can rest assure your gift will be an impressive and unforgettable one! Limited on time? Serente Spa has you covered. Our gift cards are available to be mailed out to wherever you desire. Call or email Serente today to take advantage of the gift they won't return.